Visit at Neelkanth Mahadev in holy month of Saanwan - Ghumakkar - Inspiring travel experiences. 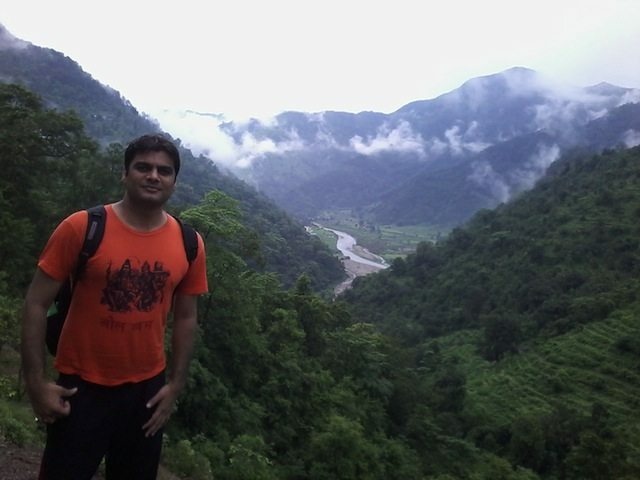 I had an old desire to visit Neelkanth Mahadev, which is situated at the uphill near Rishikesh. 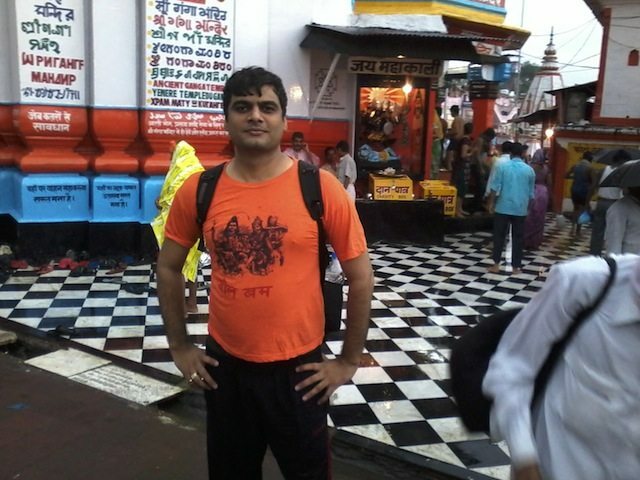 Last year, I visited Haridwar to bring holy water of Ganga in the sacred month of Saanwan, I couldn’t go Neelkanth, but visited Daksheshwar Mahadev Temple in Haridwar. I couldn’t post that travelogue as my brother-in-law’s mobile camera which we were using for clicking pics in our journey, was stolen with all pics gone. It was very heart-breaking. Last year I asked a wish which got fulfilled, so this year 2013’s Saawan month, we planned to offer the holy Ganga water from Har ki Pauri to NeelKanth Mahadev. One more Ghumakkar was added to the gang, my Cousin’s husband Dilip ji, who accompanied us on the journey to Tarkeshwar Mahadev. So we were three now, me with my brother-in-law and Dilip ji. As per planned I reached Bijnore at Dilip ji’s place at the night before Shivratri of Sanwan month, dated August 4. Ashwani was to join us on the way to Haridwar next morning. We left Dilip ji’s place at 4 AM and joined Ashwani at Haridwar via Chandok & Bhaguwala. 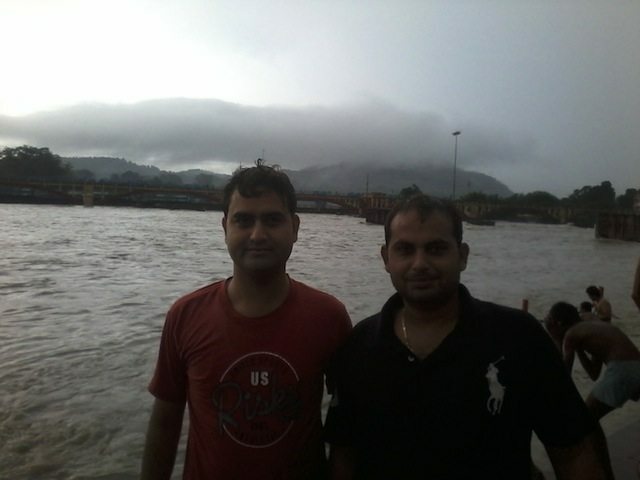 We met at Chandidevi bridge and proceeded towards Har ki pauri. 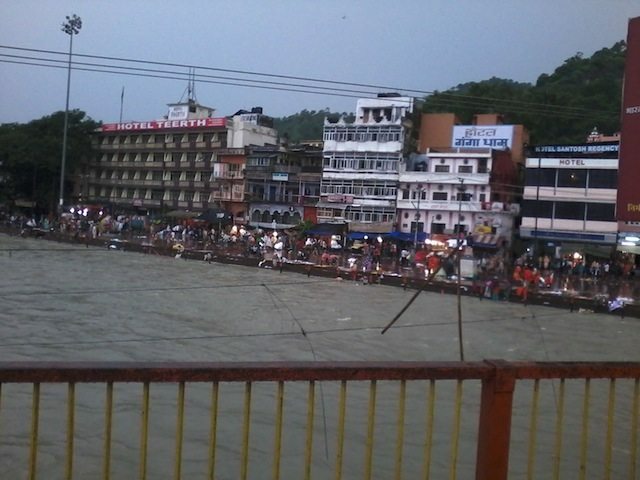 There was not much rush at Har ki Pauri as we expected because most of the Kawariayas had left for their places after getting Ganga jal. We had bath in river at Har ki Pauri. The water of river was muddy due to rains. It was continues rain in our whole trip. After holy dip we performed Ganga pujan, bought some containers to fill Ganga jal to offer at Neelkanth and some for home. After all this, we decided to have breakfast at famous Mohan Puri wala near Har ki Pauri. We had Poori with Aalu sabji & Choley and a glass of delicious lassi. On our way to Rishikesh we observed that there was an expected fall in the count of tourist post Kedarnath tragedy. 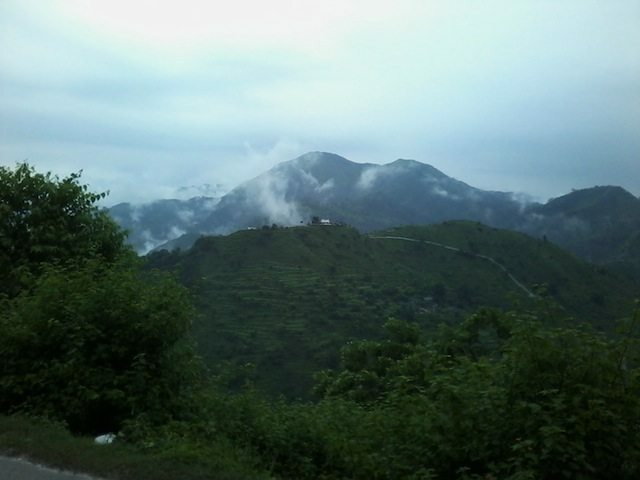 As I said it was a rainy day and hills look breath-taking in rains. 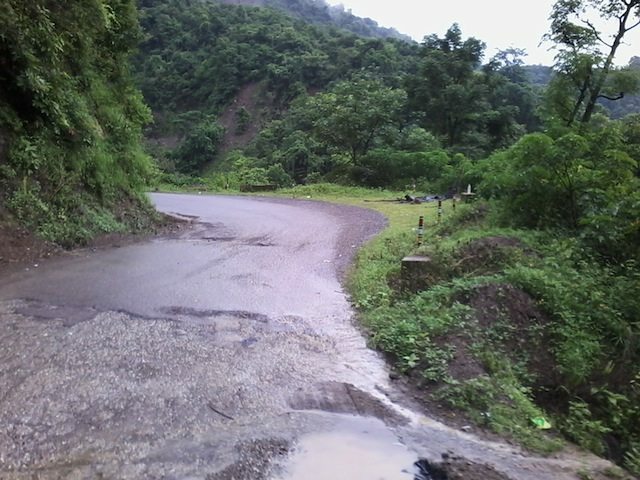 It was not easy to ride bike on wetty roads but we managed. I was on my CB twister with Dilip ji and Ashwani was on his modified bullet Electra. 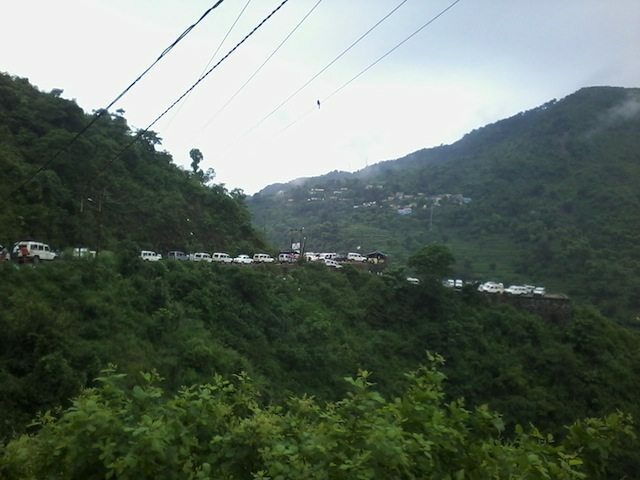 We chose the route via Lakshman Jhula. 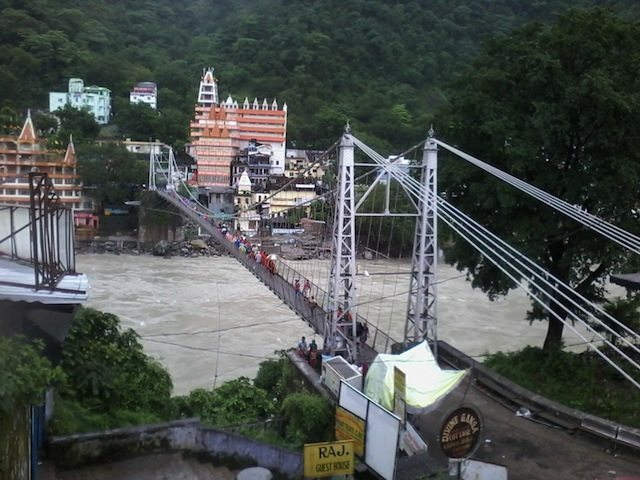 Lakshman Jhula is an iron suspension bridge, built in 1939 and is a landmark of Rishikesh. A similar bridge near Lakshman Jhula is Ram Jhula. It is said that Lord Ram’s brother Lakshman crossed Ganges on jute ropes between the place where this bridge is built. Situated 2 km away from Swarg Ashram, this jhula provides a beautiful view of famous temples, ashrams and River Ganga. 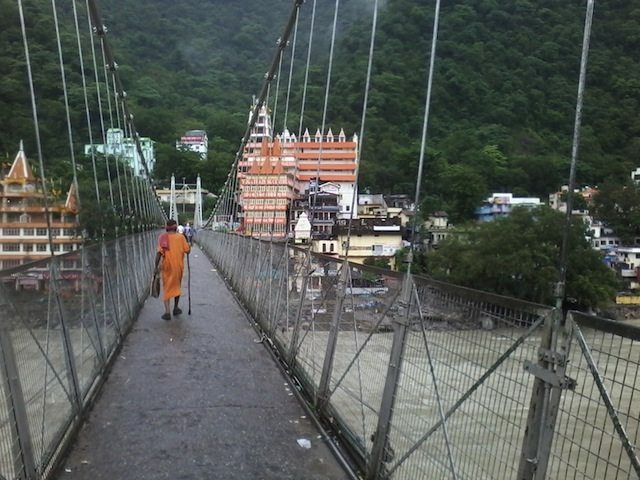 The Lakshman Jhula is used by the people as a path for visiting Swarg Ashram and Gita Bhavan. On the either side of the jhula, there are famous temples like Lakshman Temple and Tapovan that are also frequented by the tourists. It was an interesting ride as we shared the space with pedestrians, two-wheelers, cows, dogs and monkeys! There are quite a few eating joints for Indians (Dhaba-style restaurant) and foriegners (German Bakeries) where you can sit back and enjoy watching people passing by. 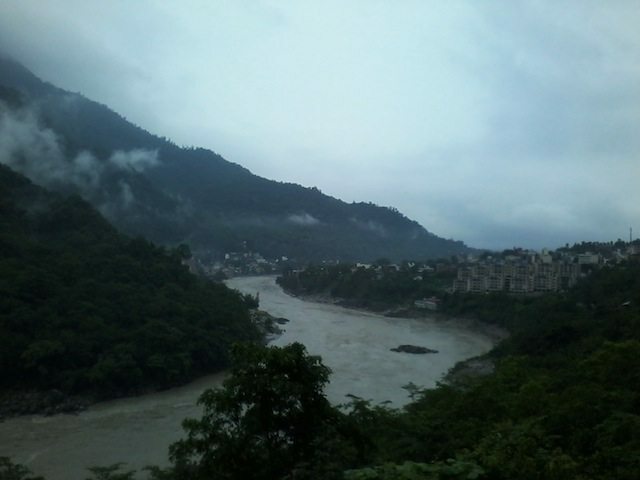 You can also walk down from Lakshman Jhoola to River Ganga to go rafting or for a boat ride. Very soon we were on route to Neelkanth Mahadev Temple. The roads were slick and patchy, crossing the dense forest, we were thoroughly enjoying the route. We had some small halts to capture the view in mobile’s camera. I didn’t carry my Nikon camera this time as couldn’t take the risk to lose that. There was no rush on the route, may be because of rain or some other reasons. We maintained the speed of 40 to 50 kmph and reached near the temple with in almost 2 hours from Rishikesh. We parked our bike at saperated two-wheeler parking and walked towards temple. There were small shops for prashad. At one of them we left our bags and bought prashad to offer lord. The temple had huge parking area and a well maintained toilet managed by Sulabh Shochalya. Because of rain and festival season the temple premises was not looking Clean and orderly as it usually be. We again had brief bath in water spring of temple area and join the queue for Neelkanth Mahadev’s Shivling darshan. It was a brief darshan of Shivling, I offered bilva leaves, flowers and Gangajal. As an ardent follower of Lord Shiv, it was life-time moment for me. Neelkanth Mahadev Temple is dedicated to Nilkanth (Lord Shiva). 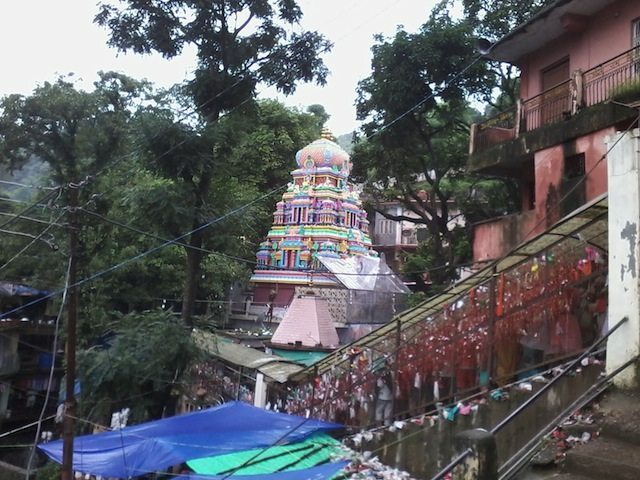 The temple is situated at a height of 1330 meters and is located about 32 km from Rishikesh. The temple is one of the most revered holy shrines dedicated to Lord Shiva and is a prominent Hindu pilgrimage site. It is surrounded by dense forests and is adjacent to the mountain ranges of Nar-Narayan. It is enveloped between the valleys of Manikoot, Brahmakoot and Vishnukoot and is located at the confluence of the rivers Pankaja and Madhumati. According to Hindu mythology, the place where the Neelkanth Mahadev Temple currently stands is the sacred location where Lord Shiva consumed the poison Halahala that originated from the sea when Devas and Asuras churned the ocean in order to obtain Amrit. This poison that emanated during the Samudramanthan made his throat blue in color. Thus, Lord Shiva is also known as Nilkanth. 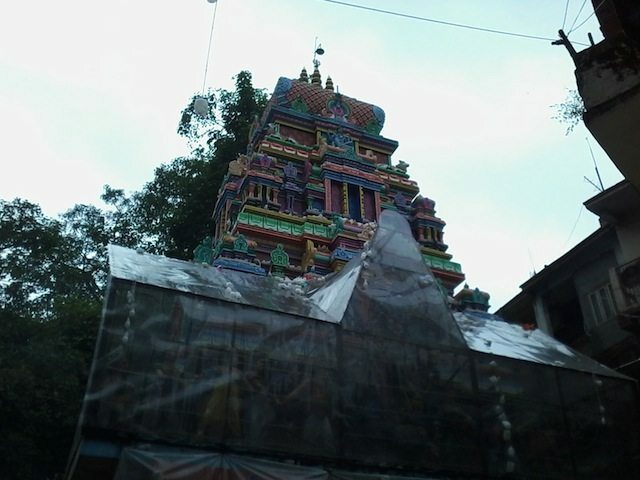 The top of the temple is adorned with sculptures of various Devas and Asuras depicting the Samudramanthan. Neelkanth Mahadev in the form of Shivalinga is the presiding deity of the temple. Maha Shivaratri is the most prominent festival celebrated in the temple and lots of devotees flock to the temple during the festival. The devotees who pay a visit to Neelkanth Mahadev make an offering of Bael leaves, coconut, flowers, milk, honey, fruits and water to the Lord Shiva. 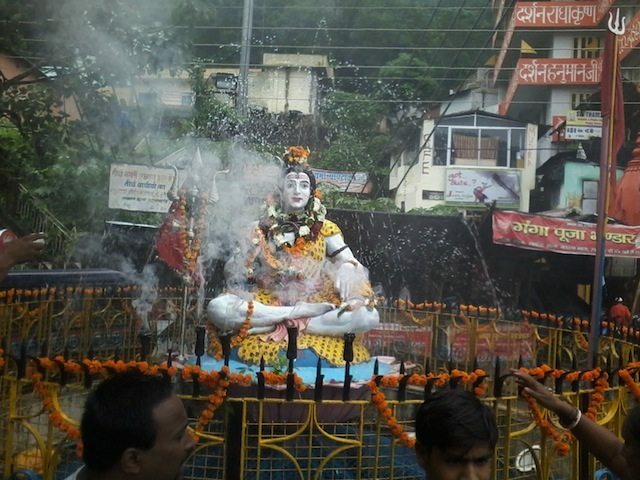 The temple observes two fairs that are held annually on the occasions of Maha Shivratri (Feb-Mar) and Shivratri of Shraavana month of Hindu calendar (July-Aug) during which the devotees (Kawarias) trek from Haridwar to Neelkanth Mahadev Temple. We came out of temple after having blessings and found the shop where we left our bags. We had tea with maggie there and left for parking. It was a great day, we were on the way back, leaving the hills behind; thanking Shiva Shankar for his blessings and making earth so beautiful. I would love to visit here again but some other time with my son Ishaan. I am Vinay Rajput. Love to explore the hills & valleys of our beautiful country. An MFA by qualification & Designer-Artist by profession. Here I am to share my travelogues. All the Photographs are very well taken. Road seems to be good now. Long time back, I also went there in my RX-100…that’s my first long drive in the hills and it’s a awesome experience for me. I wish to do such trips once in a while. Thanks Amitava for liking the post. 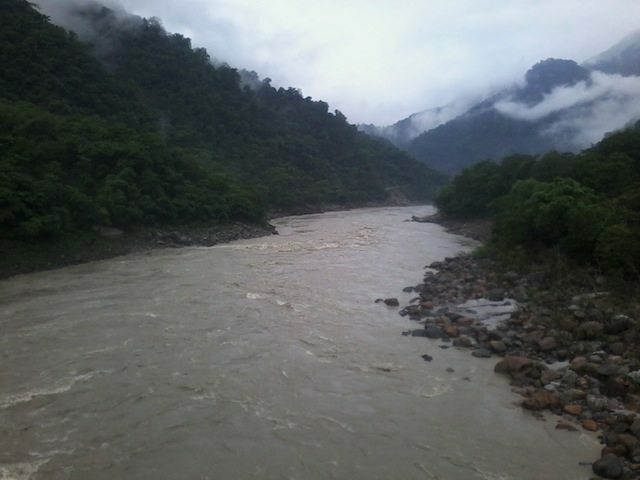 Beyond Rishikesh, there is another world, amazingly beautiful. Neelkanth Mahadev is must ride location. I loved the place. Long time Vinay. Glad to see your story in print here. I had the same query as Amitava. When we last went to Rishikesh, we learnt that there is some climbing-up to be done (or a 4X4 jeep track). My co-passengers were not very keen so we let it go. We didn’t find much information so it may not be completely accurate. Can one now go all the up to temple by a regular car ? The photos, esp of the Lakshman Jhool with a Sadhu walking by is a great frame. Hope to read more from you in future. Wishes. Thanks Nandan. I have 3 months old son now, so travelling will be more minimal now. Yes, you can reach the temple by any car. Roads are good, ample space for parking. You would love the way to this temple, really beautiful hills are there on the way. I loved the whole journey. I will wait till my 3 months old son be able to enjoy travelling…Abhi to use uske nanihaal hi le ja sakta hoon. Recently I visited Lasdowne with him, but I didn’t enjoy the journey as I kept myself in taking care of him, so I decided to first let him be li’l big so that we both can enjoy the ghumakkari. I am glad that you like the post. Thanks. Welcome back Vinay, Really impressive log and pics were stunning. Many congratulations for being blessed with son. Lots of love to new guest. I named him Ishaan (one of the names of Lord Shiva). I am glad you like the post. 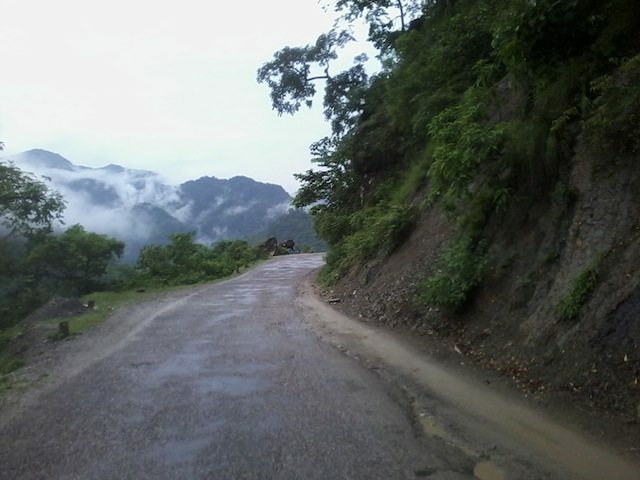 Really nice and inspiring journey in the midst of rainy season, when mountains are on its fullest glory. 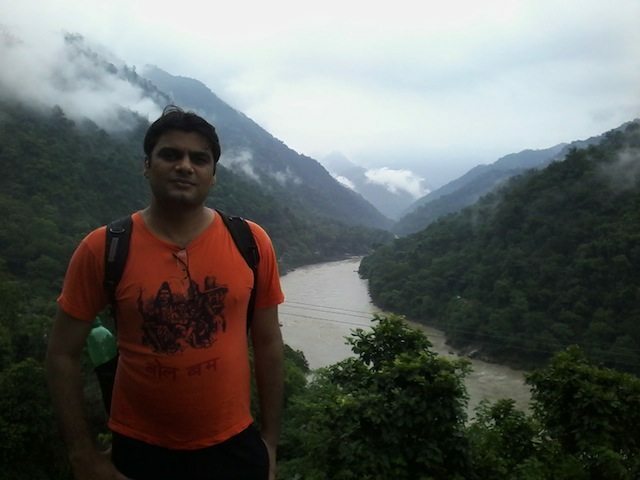 A few years back, we visited the place covering many places like of Haridwar, Rishikesh to Paunta Sahib in Himachal. Thanx for make me cherish those memories once again. I love the way you write in Hindi. I read all the posts of yours. There are a few writers in Hindi on Ghumakkar like Mukesh ji, Sushant ji, Ritesh ji and now you. I liked Paunta Sahib very much, very calm place. 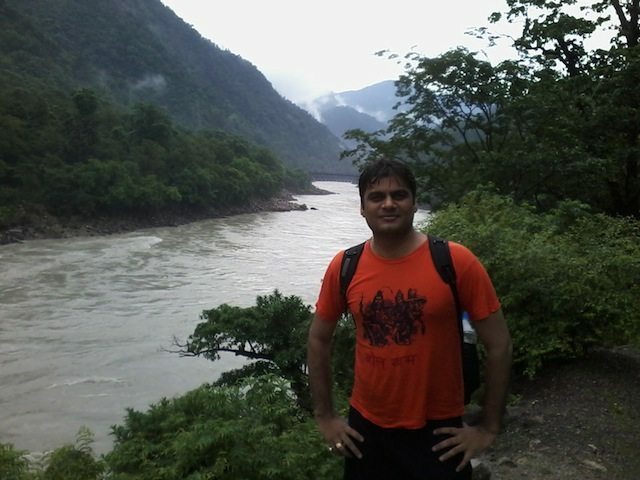 Have been to Rishikesh many times but never have been to Neelkant. You must go there with family..its in dense hills. Roads are good. If going with kids, carry your food/drinks. This is best time to be there. 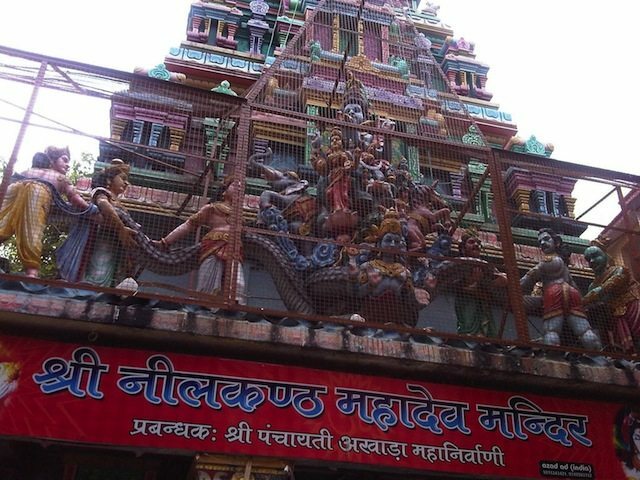 Nice to read about Neelkanth Mahadev temple.. I have been there three times but not it’s more than 15 years. 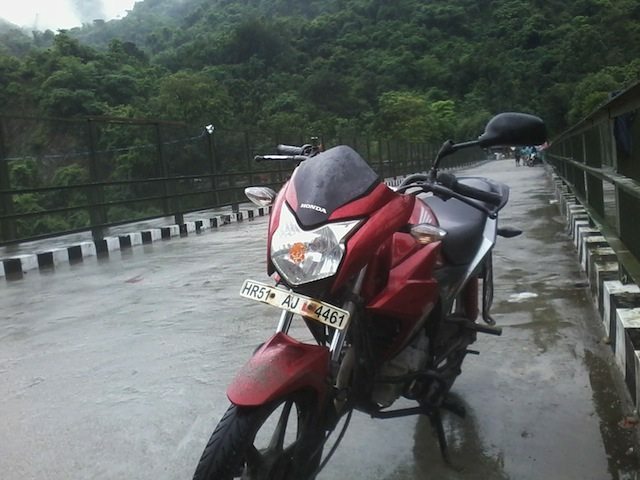 everytime we have visited on bike and from Rishikesh to temple gone by foot on hilly route of around 8-9 KM. Pictures are good……… Thanks for refreshing the memories. 15 yrs is a long time. Place should have been changed, I think. I saw many kawariyas/deevotees going on foot. It was fun and unforgettable experience for me. The post brings back memories of Rishikesh from long ago. 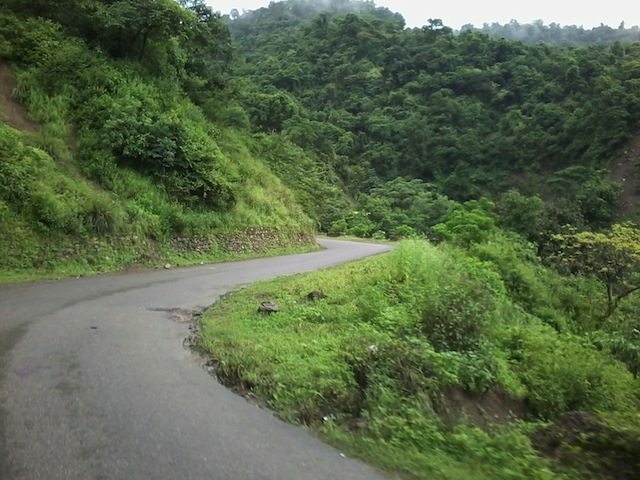 The hills are lush in the rains. The mobile camera is quite competent. The temple is colourful – reminds me of temples I have seen in AP and Karnataka. Its only 2 mp camera, better than nothing. It was raining during the whole journey, so couldn’t carry camera. 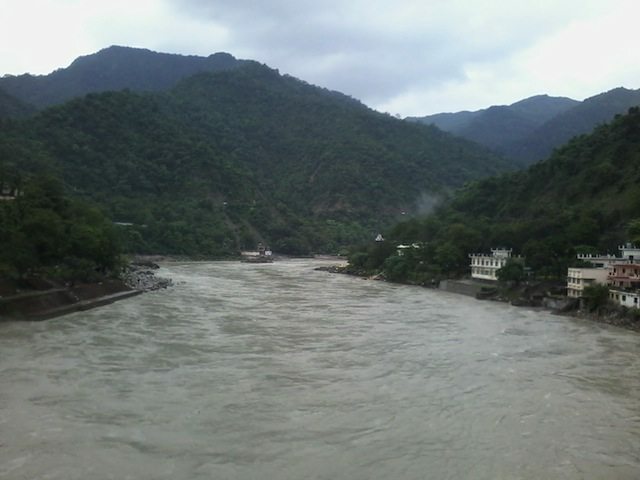 Rishikesh is very calm and beautiful place where I can be anytime. Being there gives a break from this fast running life of metro cities.